Click the tabs for further info (although the map is impossible). Comida de Tierra Caliente, Aporreadillo, Frito de Res, Frito de Puerco, Carne de Puerco con Morisqueta, Uchepos, Toqueras, Cecina, Chabindecas, Quesos, Requesón y Jocoque, Mole con Corundas, Enchiladas con Huilota, Música en Vivo de 3 pm a 5 pm. Autentica Comida Regional de Tierra Caliente Atendido por sus Propietarios. Horario de Lunes a Domingo de 9 am a 6 pm Próximamente Cenaduría. A few of us have seen a newer location beyond the Bimbo Warehouse, on Calzada La Huerta, (Mex 14), heading toward Pátzcuaro. This is on our want to try list. I don't see mention of a newer location on the link you provide, perhaps it is unrelated except by name. At times new restaurants open using the name of another restaurant that has a good reputation. That might suggest the Restaurant Caracuaro on the pereférico at col. Michelena is the real deal and might be a good one to try, and try first. I know of other instances where restaurants by the same name are operated by other family members of the original so could be very similar. Still, I would be more inclined to visit the original. I'd choose the original also. It's not much out of the way for us. Also, the hosting website hasn't been updated to show the new location. I still have not visited the restaurants Carácuaro in Morelia yet. My neighbor who owns the panadería next door tells me he and his family was in the town of Carácuaro this past Sunday. The town is located just a few kilometros past Nocupetaro about 2/3 the distance to Huetamo along the highway going out through Villa Madero. They had visited a restaurant there and enjoyed a comida of caldo de iguana. At this point in time I still have not tried iguana other than having consumed some of the sangre in my micheladas. With a few friends in Guacamayas we were promised a comida of caldo de iguana but time constraints prevented us from being able to keep that appointment. I had been with those same friends on a iguana hunting expedition in the arroyos in back of Guacamayas where they had bagged several wile hunting with pellet guns. The would take aim into the trees where I myself was unable to spot them with my own eyes, and with single shots would fell their prey. They would bleed their captures into our beers boasting of boosts of strength and perception along with increased longevity and other such claims. After consuming a bit they reported watching my eyes becoming bluer with each trago. After a bit more than an hour we left the arroyos with a mixed bag of about eight green and black iguanas. I was told by them the black iguana meat was not so sweet as the green and was really only suitable for making caldo. They were quite a handy bunch, having been along with them on several occasions to some desolate Guerrero beaches where fish and langosta were caught, prepard, and eaten at the beachside outings. Another time with them we spent an afternoon of beer-drinking along Rio Balsas where we had brought carne de puerco and prepared carnitas in the traditional tub for that purpose cooked with firewood collected along the river bank. These brothers also had a few maguey growing at their Guacamayas home they used for making pulque. During the visit to their home when I first met them they were surprised I had inquired about the milky-white drink one of the brothers was drinking asking if any pulque was sold close by. Astonished I knew what it was and that I liked pulque they immediately accepted me into their fold and provided me with a cup of my own of their home brew. That looks like a very upscale pulquería from what I see of it. Love the imagery. Perhaps the kinds of visions one might have when partaking heavily of some exotic mezcals and cactus blends. Well, I don't know if Las Duelistas is "upscale", but it was renovated to its current look, in order to attract a young, "hip" crowd. Last time, there was a borracho lying on the sidewalk outside. We carefully tiptoed around him. Inside, was a psychedelic vision and a storm of music. Pulque is very cheap, but I don't recall what we paid for a medium pitcher.No tables were empty, but a young couple invited us to join them. They gave us a taste of their pulque d' avena. Food was omn the menu, but we were on our way to "El Huequito", Calle Bolívar, so we didn't partake. 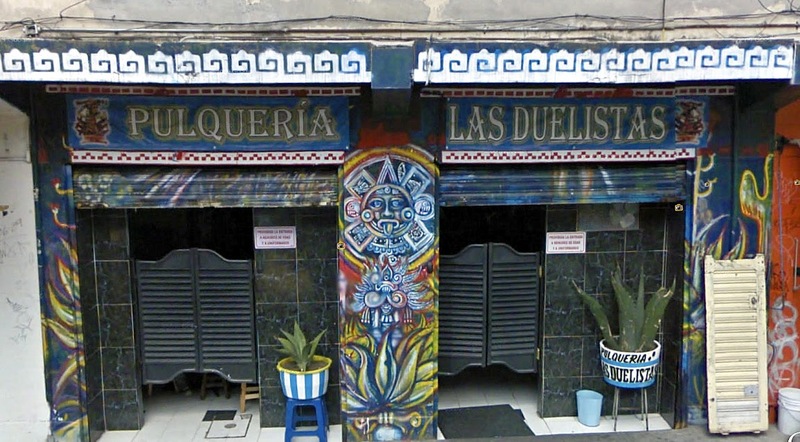 Las Duelistas is located in what I call "El Barrio San Juan", a foodie paradise, anchored by el Mercado San Juan. Next door to Las Duelistas is La Molinera El Progreso, a shop selling every spice, mole, culinary nuts and seeds imaginable. Around the block is the excellent Panadería La Pliarica. How did we get to Mexico City from Caracuaro? The address and maps cause some confusion though. The address given is Pereférico Paseo de la Republica 3067, col. Fracc. Mariano Michelena which to me is thought to be somewhere around the railroad tracks crossing west of the salida a Pátzcuaro and on the outside side of the pereférico. However Paseo de la Republica would be the part of the pereférico to the nort side of town and in that section known as Pereférico Independencia according to the/a popular printed Morelia map, but then our maps are often known to be confusing if not altogether wrong. Then there are various colonias with simillar names that may have a different prefix, as in this case Fracc. Mariano Michelena. The map given at http://www.todamorelia.com/minformacion.php?idempresa=960# shows only a pointer on a blank background. Not much help. Is the one you have noticed near the R/R crossing more or less? I do notice their sign has an iguana prominently displayed. Not sure that will be found on the menu but that's what side-tracked us to discussion of pulquerías in DF earlier in this thread. I think one would find a menu somewhat like that of Fonda Marceva. Maybe a more extensive menu. That picture of the building is right on. That is the one. Just remember Google Maps doesn't do well with Mexican streets that change names ever few blocks. As for location, it's pretty much acrss the street from the Aduana bulding which is next to the Pemex and the Aduana is in front of the Tránsito Municipal bldg. If the officials eat there (??) surely it must be good. I noticed on their sign they have chivichecas, among other rare, picante dishes of La Tierra Caliente. I suggest bringing a big appetite and a bigger pack of Tums. Why waste time seeking good sushi in Morelia? Eat regional Michoacán food and enjoy it more. I saw chivichecas and drew a blank, ran it by Tere but nothing came up. Anything more you can say to describe it further? Nothing rare about picante dishes when describing food of la Tierra Caliente. No doubt they will have a couple tamer dishes for those like Tere. Some like it hot but not everyone does. I don't expect their aporreado will be tamed down for the tourists like what you might find in the portales of the centro. I expect they know how to make good michelada too. Tierra Caliente restaurants should include Tums on their dessert menu. I love every burning moment of eating it though. The menu sounds great and I am looking forward to trying this place. Edit to add: I take it back, it was chabindecas I saw on the menu that I asked Tere about. Your chivichecas are yet another dish unknown to me. Also, I added the photo of Restaurant Caracuaro to your OP at the top so it will show up on the preview page. A visit here may make a good photo opportunity. There, it has been warm these days, first day of Fall with the rainy season over, I decided to start with a michelada of Negra Modelo. The bring the mug all decked-out and with the mixture preparada, you selct the beer and add it yourself. That orange wedge was a nice flavor kick. Don y Doña Cuevas were in Morelia for some shopping and we decided to get together at Caracuaro to give it a try. Right alongside the pereférico he found us a table on the decorative upstairs loft to get a little distance from the highway hum. Already on the table when Tere and I arrived were the standard totopos and two salsas of mild and Tierra Caliente. There was also a little dish of soft white cheese and a knife. Very quickly a mesera came by with a fried, thick tortilla like what you might use to make sopes but were plain and served our table a bowl of sour cream to top these. This seems to be standard procedure at Caracuaro to bring around various entradas for the guests. They get high points for service and presentation, beautiful and attentive meseras that handled all the details with smiles and care. Had we realized this we might not have ordered our own entradas but the Cuevas clan decided to share a chavindeca de carne puerco (or did they have the res?) while Tere and I shared some huchepos con crema. These were not the very, very sweet kind but somewhat so with a pleasantly salty flavor. The chavindeca was like a large tortilla covered with carne with a piled-high salad over the top covered with crema and crumbled queso topped with a chilito, and is that a wedge of aguacate? Doña Cuevas ordered some red pollo en mole which she said was very good. Tere ordered a pechuga stuffed with jamón, queso, chorizo, y camarones. They both were accompanied with arroz and frijoles. The mole came with some odd corundas. Unusual for the Cuevas clan were the flat amarillo or ceniza corundas but what I had never seen before, these corundas were wrapped in platano leaves. I dubbed them corundas Oaxaqueños for their appearance though as far as I know they don't have corundas in Oaxaca, no corundas I know of much outside of the Morelia/Pátzcuaro. I am supposing some part of the Tierra Caliente that may be the norm to use hojas de platanos though I have never heard of doing so. I figured perhaps in Ziracuaretiro which is not too far from Pátzcuaro and at the edge of the cold/hot climate cutoff where they grow platanos that may be the practice though I have never seen it. Tere's pecuga relleno came with a nice salad of lechuga, jitomate, cebolla, pepino, y aguacate, con limón y naranja for a bit of zip. As usual for many restaurants here our plates did not arrive all at once. The entradas we ordered did arrive first and for us two señors that ostensibly ordered them though we shared them with our mates. The ladies then received their plates first though they were not necessarily the easiest or quickest to prepare so it would appear some thought did go into who would be served first. This did not matter much as there was still snack and appetizers on the table so everyone could nibble. They have a fair-sized menu and a page of cenas that are only served after 7pm. I was going to be experimental but following a brief discussion I decided to order a Tierra Caliente favorite of mine so I could campare it to other restaurants. I ordered the aporreado (aporreadillo as it is called in some places) which is made from dried beef and egg. The beef was not tough as is often the case, and it was a bit reddish in appearance so I'm guessing it was preserved with some sodium nitrite to preserve color. Sadly the sauce it comes in was not creamy and thick but light and clear-ish color. I was not crazy about the flavor. If you like aporreado I still think the best is served at Fonda Marceva but it is wise to have some Tums ready awhile after eating it. Lastly, Don Cuevas' plato fuerte arrived which was OK as his entrada was perhaps the largest. I believe his plato was the carne puerco frito. The sauce was reddish in color and appeared it may be a salsa guajillo but he was engrossed enough in eating it I don't believe I got a complete answer about that inquiry, just said it was good. It was served with a plate of onions, limón, and some yellow pepper or perhaps chiles perones. I believe his comment about his entrada was that it was OK but nothing to get excited over and I got the idea he was a bit more enthusiastic about this main course than his chavindeca. Almost everyone passed on dessert except for me who thought flan sounded like a good idea. I didn't eat a lot of my apporeado, cleaned up the frijoles pretty well but let the rice slidd by. It was prepared with mixed vegetables but as is customary the Mexican chicharros (peas) were somewhat hard and I'm still not up for that even after I have been here a number of years. Don Cuevas had a café de olla as I suggested, the ladies had shared a pitcher of naranjada and were finishing that up. I also had a café de olla after my michelada and had some left to go with the flan which by the way was quite good, good texture and a gread caramel sauce poured over it. I believe the overall comments about our plates were that they were good but nothing too exciting. The exceptions there were my aporreado which I really didn't care for and Tere's pechuga relleno that actually was fairly good. Because of some of the extras we received, the very good café de olla, my rather excellent michelada and the overall impression of the restaurant I think we all said we would be happy to give it another visit. Prices were moderate though I don't know what the final tally came to as I was already lounging at an outside table out front having an after-dinner smoke when the check arrived. Peter has nicely covered the highlights (and one or two lowlights) of our meal at Restaurante Carácuaro. The chavindeca (the correct spelling) I had as an entrada was of bistec, although pollo or chorizo were also offered. It was nice, but nothing unusual about it; something like like a tostada compuesta as made in in Arizona, but the double decker tortillas are not crisp, but soft. The Frito de Puerco was fine, but the version I had at Fonda Marceva had a better sauce. I don't know from which chile the sauce was made. It could have been guajilos. The rice alongside was soggy and mushy. I think it was a reheated leftover. The frijoles were ho hum, así así. Doña Cuevas' mole was good, but not extraordinary. It had a single, small thigh or leg in the pool of mole, but that is the usual manner of presentation. My mezcal was a generously poured glassful, accompanied by some juicy orange slices sprinkled with coarse salt. The "corundas" that accompanied the mole were truly abysmal. Dense and nearly tasteless stodge. The baskets for tortillas held ONE large tortilla per visit by our waitress, but truthfully, that was sufficient for us. As Peter says, the café de olla was richly brewed and better than most I've had elsewhere. Our lovely waitress was sincere and made a good effort, but she was, I think, unpolished. She didn't take our drink orders immediately until we hailed her, and I had to ask for a glass for a bottle of agua mineral I'd ordered, which arrived quickly, but no glass. To her credit, she brought fresh clean knives and forks with each new dish. That's unusual. I note on the menu that on Saturdays and Sundays, they serve Mole de Olla, a rich beef and vegetable soup, very similar to Churipo. I might be tempted to return to try that. I've made it at home and its a long, many ingredient recipe. In summation, Restaurante Carácuaro has some good points, but overall, Fonda Marceva is considerably more polished, in food preparation, attention to detail and in service. Pretty waitress notwithstanding. I have some photos as well, and may post a few of the better ones here later. Toquera. Resembles a corn latke with sour cream. It was kind of tough, but I'd waited a few minutes to eat it. All it lacked was some caviar! Uchepos. Looks very good. Helps support the local dairy industry. Chavindeca. Lettuce, tomato, aguacate, thinned crema, bistec de res inside. Nice, but boring. Pechuga Rellena para hacer la panza rellena. Corundas de la Tierra Caliente. Don't bother. Frito de Puerco. Pretty good, but not worth a special journey. The main dining room was filling as we left. A lot to cover at once I may have missed a thing or two that Don Cuevas helps to fill in. The large tortilla in the basket appeared to look like tortilla de harina but was de maíz. Obviously made fresh there at the restaurant it was really a bit too thick to be truly good and one was enough. Thanks, Don Cuevas, for picking up a couple photos I either missed or had trouble including in my presentation. The huchepos looked a lot better in your photo than mine and they actually were pretty good. There were highlights and lowlights but knowing a bit more now I have a better idea what to select and avoid next time. I could make a pleasant go of it next time around but would probably do some more exploring from their menu so it could again go either way still. I have to mention the mysterious "huilota", prepared several ways: dorada, en salsa or a la diabla. Our waitress said it's poultry. Tere suspects it's another word for "guajolote" (wild or free range turkey), if I understood her correctly. If I were there on a weekend afternoon, I would surely try the mole de olla. I need to put that dish on my list of things to make, as it has been a long time since. I'd wait until the weather grows colder and the deep freezer gets emptier. Prices were moderate though I don't know what the final tally came to as I was already lounging at an outside table out front having an after-dinner smoke when the check arrived. I believe it was $536 in all, plus propina. I'll add a couple of shots of part of the menu. There are at least two full pages devoted to drinks, but I didn't photograph them. I must have overlooked the After Seven Cena menu, as I don't remember it. Sorry; no pics of the waitress.